With Sheffield enjoying a three-day heat wave recently, it was too nice to sit indoors – in other words, it was beer garden o’clock! However, after the beer garden high, comes the inevitable post-beer munchies. After an afternoon of sitting in the sun, me and my beer garden partner in crime were in the mood for cuisine from a warmer climate, so the Latin-themed Las Iguanas seemed ideal. Las Iguanas is situated in the swanky West One Plaza, which is basically a courtyard dedicated to my two favourite pursuits: eating and drinking. On this sunny Saturday afternoon, West One Plaza was packed with people swigging cold beverages, eating good food, queueing outside LOL Bubble Tea, and generally enjoying being outside without shivering/getting rained on. It almost seemed a shame to be heading indoors, even if it was to enjoy some tasty grub. 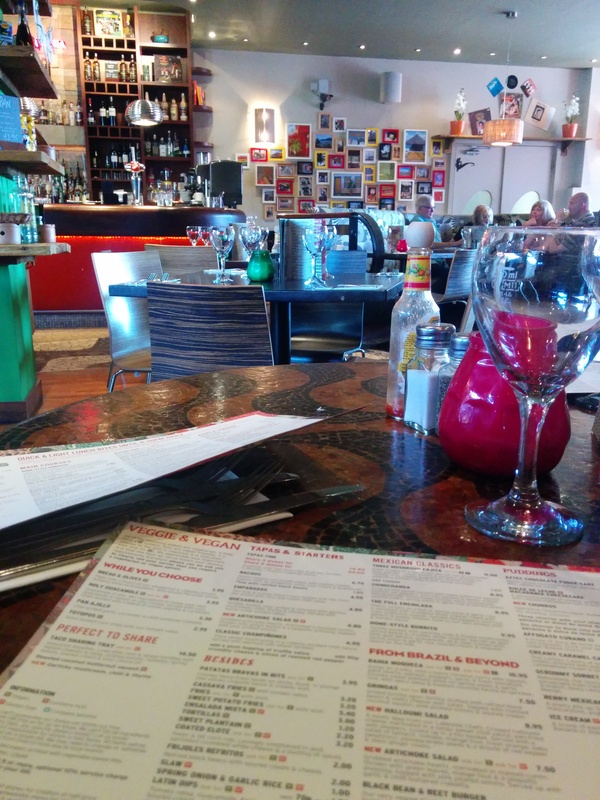 This was my first ever visit to Las Iguanas, and initial impressions were good. It’s a light, airy venue, with a carnival feel thanks to all the bright colours – from the mosaic tables and funky, patterned furnishings; to the shiny red bar trimmed with LED lights; to the wall covered in a hodgepodge of multi-coloured picture frames. Las Iguanas also pull a clever trick with a mirrored wall, which makes the place feel much bigger than it actually is. We were greeted by a very friendly member of staff, who offered us the lunchtime and the evening menu – oh, and would we like to see the vegan and vegetarian menu, too? In most restaurants, veggies are lucky if they get three meals to choose from, and vegans usually get even less. 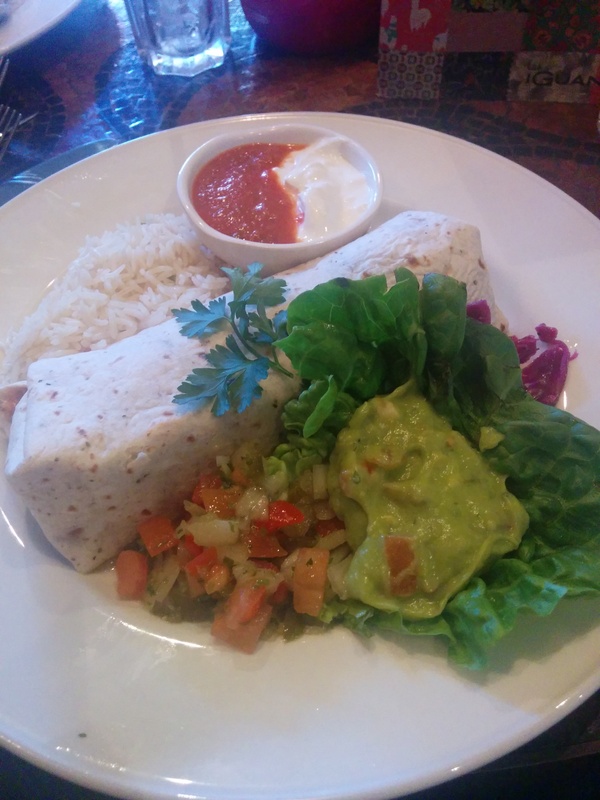 Las Iguanas may not immediately spring to mind when you think about veggie and vegan-friendly venues, but it actually has one of the most impressive vegan/vegetarian menus I’ve encountered in a “mainstream” restaurant. Many of the dishes are gluten free, too. Obviously, there’s some overlap between menus. The lunch menu is pretty much just a pared-down version of the dinner menu, and the vegan and vegetarian menu is the dinner menu, with the meat and seafood removed. But, even with all this duplication, you’ll still be completely spoilt for choice. The trio of menus covers all those tried-and-tested favourites – quesadillas, fajitas, enchiladas, burritos, patatas bravas, and chilli con carne, to just name a few. Or, if you fancy trying something new, there’s dishes that make use of more unusual ingredients, such as plantain, truffle salsa, palm hearts, and a very intriguing-sounding peanut and crayfish sauce. In the interests of trying as much of this massive menu as possible, we decided to share some starters. After much deliberation, we narrowed our selection down to the Tip Top Chipotle Whitebait (£4.50), and Calamares (£5.70). Our food order was taken by one of the friendliest waitresses I’ve ever met, who wasted no time drawing our attention to the 2-for-1 offer on cocktails, something we hadn’t previously noticed. In light of this revelation, it only seemed fitting to order some cocktails. When it comes to booze, Las Iguanas doesn’t disappoint: they provide choice, and lots of it. The cocktail menu includes all the usual suspects you tend to find in restaurants, but it also features some more exotic concoctions, such as a Columbian Cafe, Bronx Bebida, and a Jam Slam. In the end, we settled on a pair of Long Island Iced Teas (£6.75 per glass, or 2-for-1 Wednesday-Sunday, before 7.30 p.m). 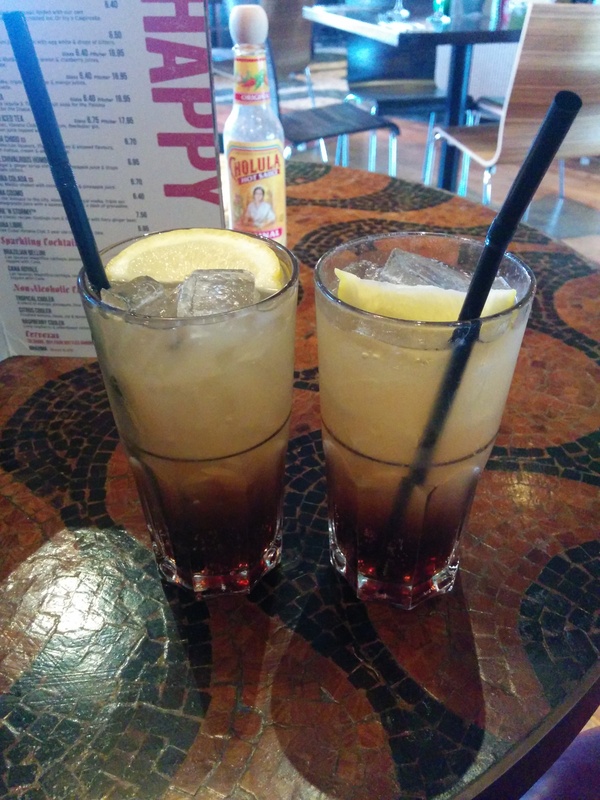 Our matching pair of Long Island Iced Teas tasted every bit as good as they looked. They had a refreshing lemon sting, and packed a boozy punch – exactly what you want from a Long Island Iced Tea. Our starters arrived shortly after, which was a good job, because these Long Island Iced Teas were strong. 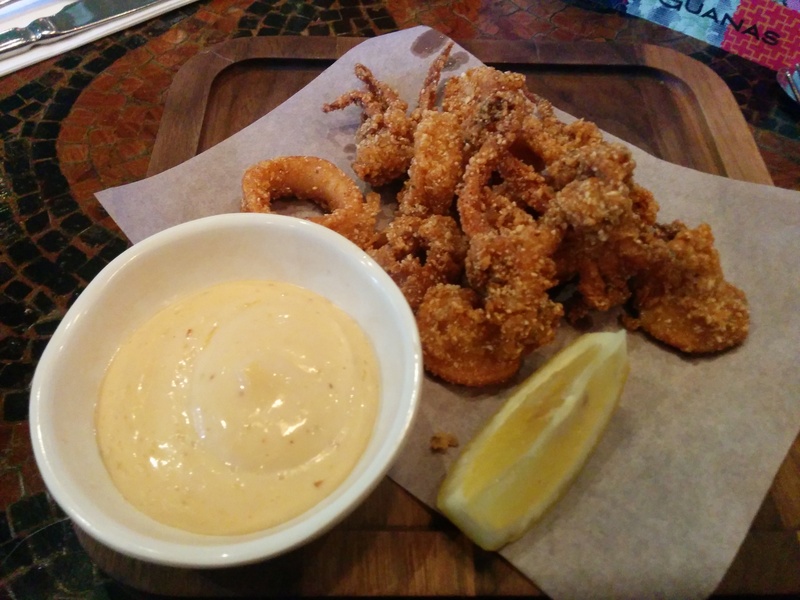 The Calamares is a portion of whole baby squid, tentacles and all, coated in crispy batter. Don’t let the long, curly tentacles put you off; they actually pack a satisfying crunch and give you the chance to really appreciate that salt-and-pepper batter. The meatier, non-tentacle parts of the baby squid were juicy, and not in the least bit rubbery. The Calamares came with a creamy dip, which had a subtle, spicy afterburn. The squid was delicious on its own, but this dip really sealed the deal. I suddenly regretted agreeing to share the starters! 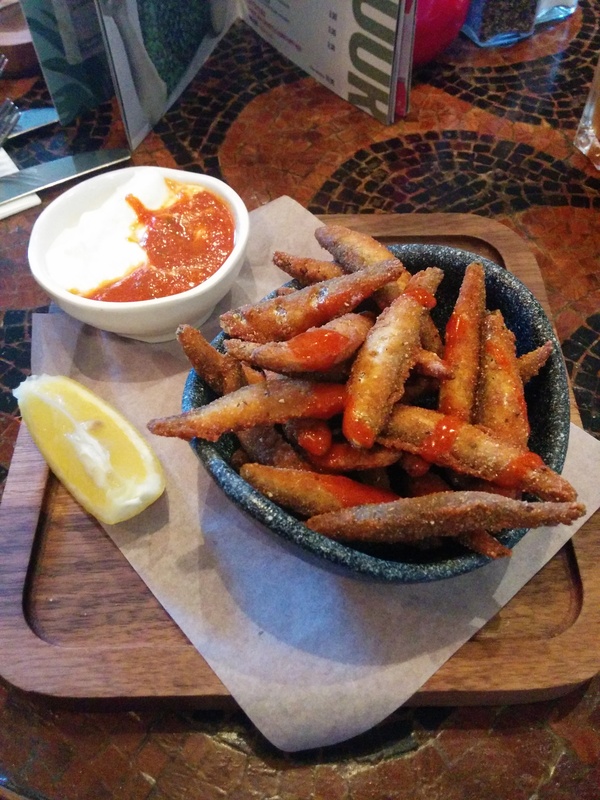 The Tip Top Chipotle Whitebait was covered in a very light, almost flaky batter, and the whitebait themselves were nicely cooked. However, the accompanying dips missed the mark: the sour cream was too thin, and the salsa lacked any kind of kick. We had to resort to the bottle of Cholula on the table; a few splashes of this bottled hot sauce delivered more flavour than the salsa and sour cream combined. Onto the mains, and despite the hot weather, I hadn’t been able to resist the curry on Las Iguanas’ menu. The ‘Bahia Moqueca’ promised a creamy coconut curry, served with plantain, spicy aji and toasted coconut farofa sprinkles, plus spring onion and garlic rice. Las Iguanas can make your Bahia Moqueca with fish and peeled prawns (£12.95) or squash, palm hearts and spinach (£10.95). 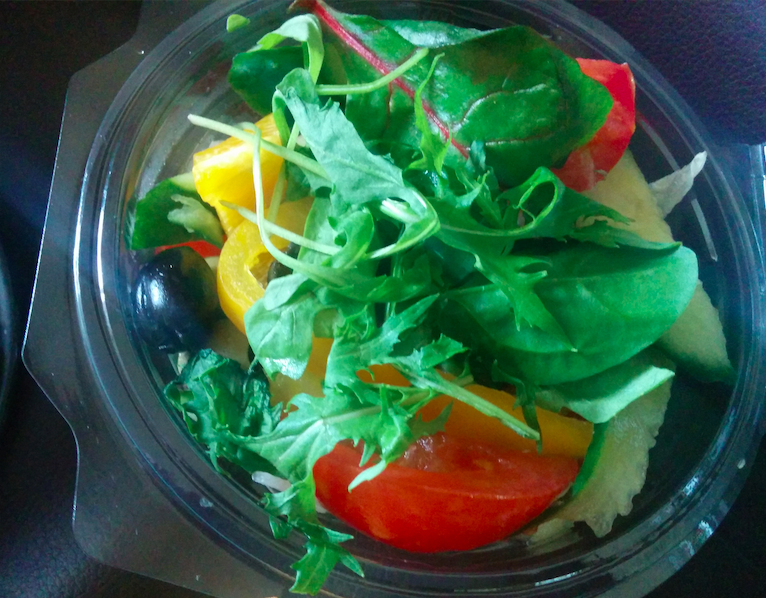 Despite my love of seafood, I’d never had palm hearts before, so I went with the veggie option. As soon as I caught sight of my food, I knew I was in for a treat. Las Iguanas’ Bahia Moqueca is a meal of two halves; the first is a plateful of chunky aji, toasted coconut sprinkles, sweet and sticky plantain, and garlic and spring onion rice. The second part of the meal, is the curry itself. Based on the menu’s description, I was expecting the Bahia Moqueca to be similar to a korma or maybe even a Thai green curry, but it was so much better than either of those. The sauce tasted strongly of coconut, but it also had a sour edge to it. This lingering, sharp aftertaste was an unexpected, but very welcome surprise. As much as I enjoy pigging out on creamy curries, the richness of the coconut can become overpowering after a while. 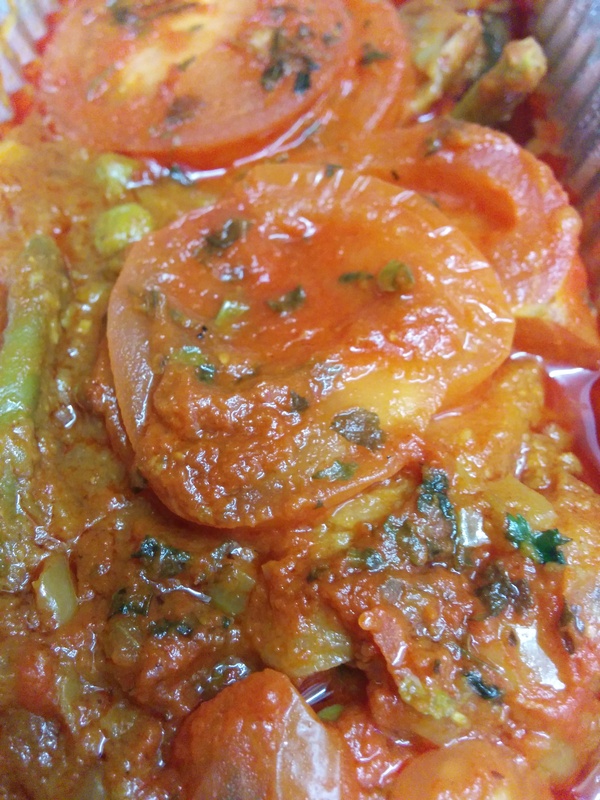 The Bahia Moqueca’s tartness helped to keep things fresh and interesting. 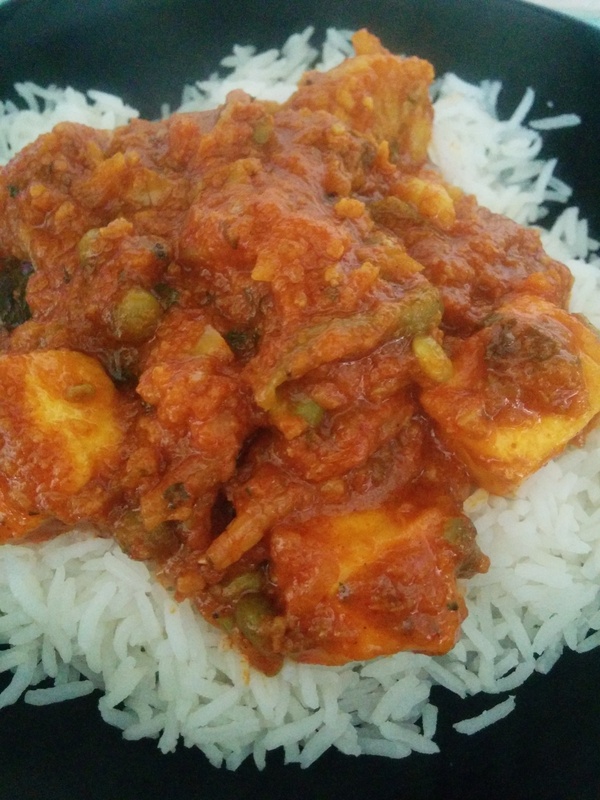 If you love coconut, or have a soft spot for sour flavours, then this is the meal for you! The palm hearts that convinced me to order the vegetarian Bahia Moqueca in the first place, turned out to be almost completely tasteless. However, they did have a really different, woody texture, and the rings of palm heart looked fantastic floating on top of the curry, so I can understand why Las Iguanas included them in the Bahia Moqueca. When it came to the extra bits and bobs that arrived with my Bahia Moqueca, my favourite was the aji, which reminded me of a chunky, homemade salsa, only it was vinegary, rather than spicy. 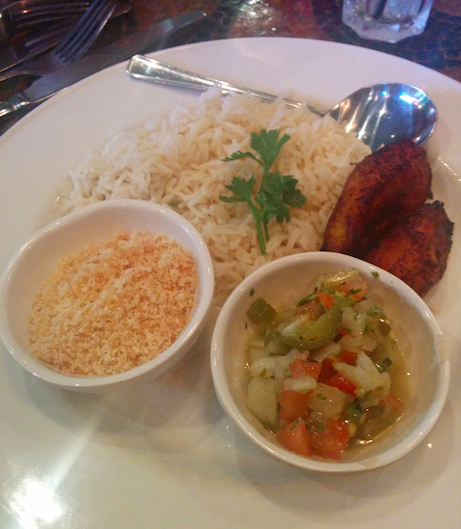 The plantains were sticky and gooey, and brought a burst of sweetness to the Bahia Moqueca. However, the garlic and spring onion rice just tasted like coconut. I enjoyed the creamy rice, but I found it strange that I couldn’t taste any garlic or spring onion at all. 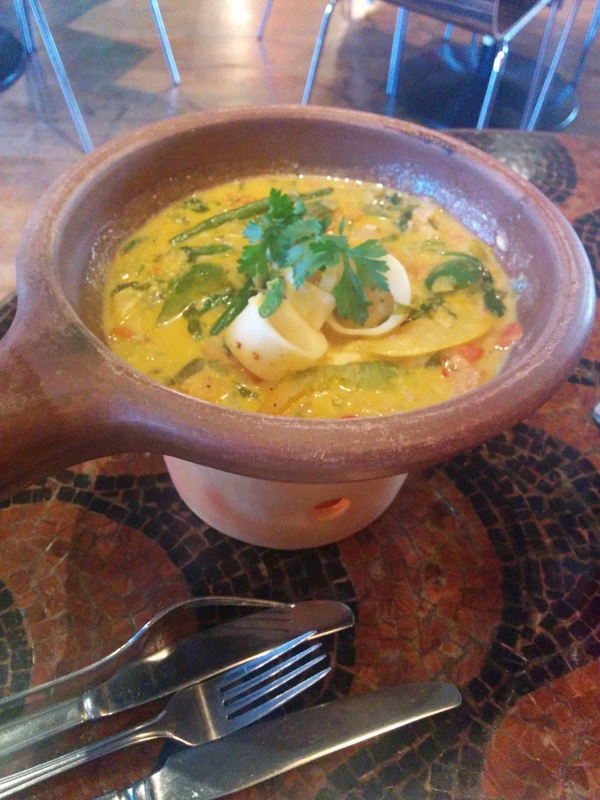 The Bahia Moqueca is easily one of the best meals I’ve had recently. It was so good that, despite Las Iguanas’ massive menu, it’ll be tough to resist ordering this again on my next visit! The other main meal winging its way to our table, was everyone’s favourite Mexican street food; the Burrito. At Las Iguanas, burrito lovers have a choice of fillings: garlic mushrooms and vegetarian chilli (£9.95); smoked chipotle chicken (£10.95); or barbeque and jalapeno shredded steak (£10.95). My dining companion opted for the shredded steak. The burrito was a good size, especially considering the steak filling, and it came with a few of Las Iguanas’ added extras. On the upside, this meant more of that tongue-tingling aji and rich rice, but unfortunately it also saw the return of the bland sour cream and chipotle sauce combo. Las Iguanas deserve top marks for the venue, the friendly and helpful staff, and the sheer scope of their cocktail and food menus. Any venue where you’re handed three different food menus on your way in, is off to a good start. Las Iguanas also strike a good balance between unusual dishes, and crowd-pleasing classics. Although we weren’t completely sold on the steak burrito, the calamari and curry were both fantastic, and there’s plenty of other dishes on the menu that I can’t wait to try. We’ll definitely be back! Sheffield burger fans are spoilt for choice at the moment, with The Wick at Both Ends, Bungalows and Bears, and the Mud Crab all serving up top-notch burgers. Between them, this trio offers everything from gourmet burgers, to greasy-but-great, American style burgers, and even a “build your own” experience, where you can concoct some truly freakish (but still tasty) creations. 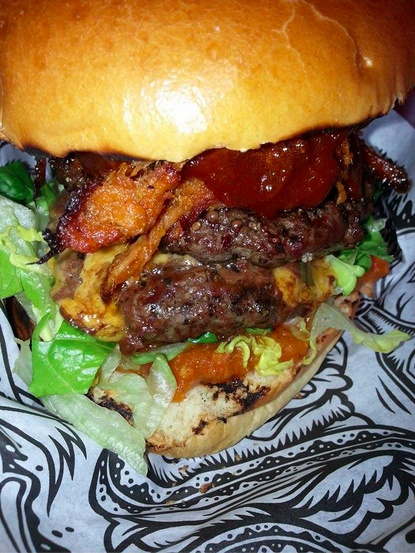 But, if you like your burgers super-sized, calorie-packed, and stuffed with so-wrong-yet-so-right toppings, then the the Harley on Glossop Road is the place to go. Where else can you get a burger with mac and cheese as a filling? When they’re not serving up big, fat burgers, the Harley specialises in loud bands, and late Friday and Saturday nights. It’s no surprise then, that the venue looks a bit rough around the edges in the daylight, but don’t let this put you off. When we visited on a Saturday lunchtime, there was just enough people to create an atmosphere, without it being tricky to find a decent seat. In fact, we managed to snag one of the Harley’s big, antique-style sofas, and settled down to get better acquainted with the menu. When it comes to food, the Harley specialise in two things: burgers and breakfast. We may have missed the breakfast sitting, but I still couldn’t resist taking a peek at the morning menu. In addition to the usual full English, the Harley serve up an epic-sounding McBuffting; a bacon or mushroom patty, combined with American cheese, a fried egg, and “techno” burger sauce. The McBuffting sounds like the kind of breakfast that’s guaranteed to annihilate even the most crippling of hangovers! When it comes to burgers, you can “build your own,” thanks to the Harley’s vast selection of additional toppings, which cover everything from bacon, to deep-fried jalapenos, to chorizo and apple jam. If you’re not feeling particularly creative, you can pick one of the Harley’s own concoctions from the main menu. All of these burgers are crammed with so many added extras, they actually sound a bit scary on paper: case in point, the “Return of the Mac,” which boasts two bacon patties, homemade pesto, Harley house relish, and mac and cheese. 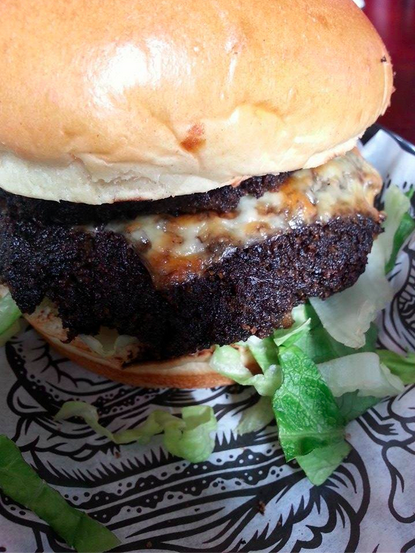 With so much to choose from, I’m a bit ashamed to admit that I built my own, rather boring burger: a Double Mushroom Burger (£5.50) with a Montery Jack cheese topping (an extra 85p). However, in my defence I did also order a portion of Jalapeno Business Fries (£4.75) to go with my mushroom-and-cheese burger. I love mushroom burgers, but when I bit into the Harley’s big, tasty-looking burger, the mushroom patty wasn’t what I’d been expecting. It had an unusual, fine texture that reminded me more of ground-up beef, than your typical chunky veggie burger. The patty had a nice, smoky flavour and was very filling, but the crumbly texture of the patty wasn’t really to my taste. Thankfully, things improved the second I caught sight of my order of Jalapeno Business Fries. The biggest compliment I can give these fries, is that they taste even better than they look (yep, such a thing is possible). 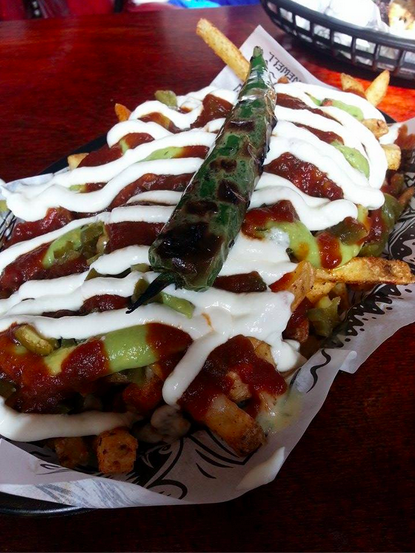 The Harley’s Jalapeno Business Fries are a truly super-sized portion of spicy fries, smothered in a delicious trio of guacamole, sour cream, and Harley House Relish. Just in case lashings of Cajun seasoning, crispy-skinned fries, and three kinds of sauce leave you thinking hmmm, but something’s still missing, the Harley throw some hot, gooey cheese into the mix, and top the whole thing off with a grilled jalapeno. Guacamole is one of my least favourite sauces, but I actually enjoyed the Harley’s guacamole, as it was fresh and tasty, and didn’t have that slimy texture that guacamole sometimes has. However, the Harley’s relish was my favourite of the three sauces, as it had a creamy texture and a lingering spicy, smoky aftertaste. The Harley need to add this relish to their list of optional extra burger toppings, and pronto! It’s one of those sauces that, once tasted, you want to add to everything. A portion of Business Fries is big enough to be a meal in itself, or it’d make a fantastic side order to share between two very hungry people. Either way, this is definitely something I’d order again. At the other end of the table, my dining companion tucked into a Pig Daddy Kane, which is a burger of two beef patties, plus pulled pork, cheese, Kraken BBQ sauce, and chorizo and apple jam (£7.95). They particularly enjoyed the pulled pork, which was flakey and moist, as well as the sticky, chorizo and apple jam, and the yummy Kraken BBQ sauce. The Harley’s menu includes a side order of Pig Pimpin’ Fries, which comes with pulled pork-smoked cheese sauce, as well as more of that Kraken BBQ sauce, so I think these fries may be on the cards, the next time we visit the Harley. The Harley is a no-nonsense kind of venue, where the menu encourages you to take your average, run-of-the-mill burger, and then add some pulled pork, a couple of different kinds of cheese, four kinds of sauce, pulled pork, deep-fried jalapenos, and whatever else takes your fancy. Fine dining it ain’t, but sometimes you have a craving for a big, fat burger, with lots of added extras. The Harley is one of the more unusual burger menus you’ll find in Sheffield and, luckily for me, they offer another veggie option: the Falafel burger. I’m looking forward to visiting again and trying some more of their menu – with a portion of Business Fries on the side, of course! 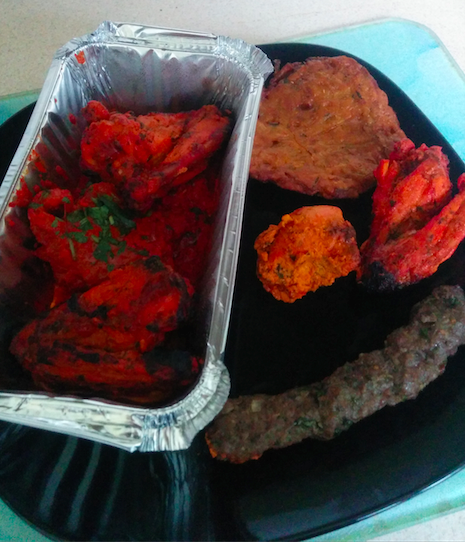 Ok, confession time: I’m addicted to takeaway. Whether it’s a Friday night curry, or a cheeky lunchtime delivery when I’m feeling under the weather; whether it’s the celebratory takeaway, or the commiseratory takeaway, or even a social takeaway when I’m entertaining and don’t fancy cooking – any excuse to order in. 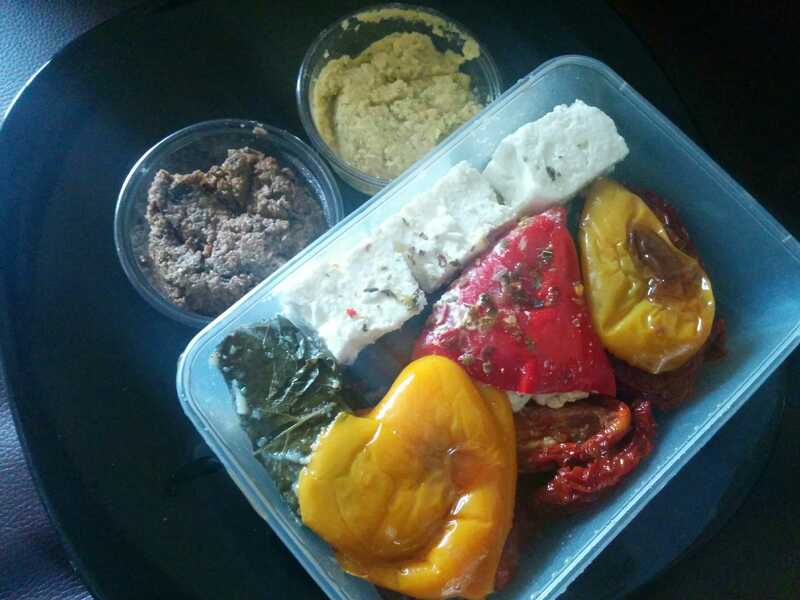 So, I consider myself lucky that Sheffield is not only a fantastic place for dining out, but it’s also great for getting delicious food, delivered direct to your door. Despite having a drawer full of takeaway menus in my kitchen, I can’t remember the last time I actually used them. Over the past couple of years, the way I indulge in my takeout habit has moved online. Gone are the days of running around the house, hunting for the right change to pay for my vindaloo. Now, I just boot up my laptop, hop online, order my takeway, and pay using my trusty credit card. 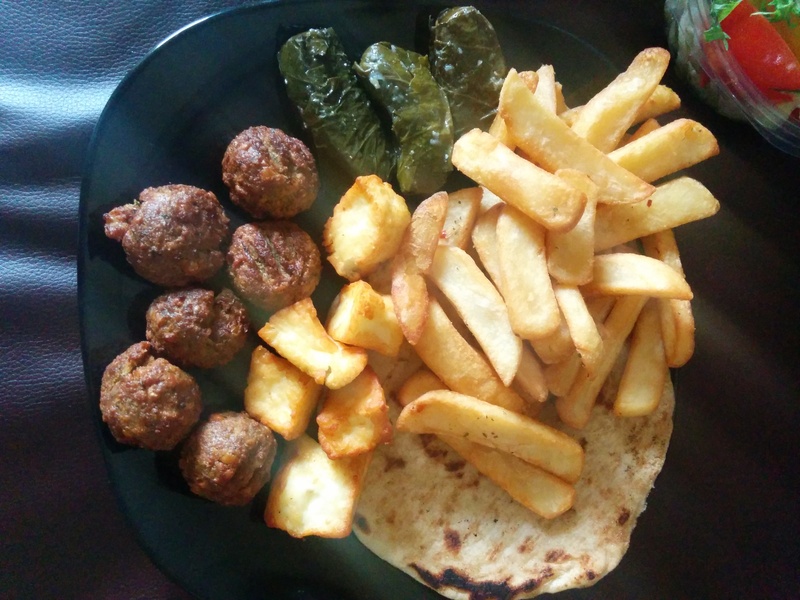 So, when hungryhouse got in touch and asked if I’d be interested in penning a few words about one of the many Sheffield takeaways that made it onto their ‘Top Takeaways’ list, I didn’t need to think twice. Stuff my face with yummy food, write some words of praise about a local restaurant, and I wouldn’t even have to leave my house? I was in, and I was in big. hungryhouse base their top takeaways list on the number of people who ordered from each establishment, plus the average customer rating. A quick look at the list revealed what I already knew to be true: Sheffield is a great place to live if you love takeaway. Not only does Sheffield put in a good show when it comes to the sheer number of establishments who’ve made the cut, but also when it comes to the range of food on offer. 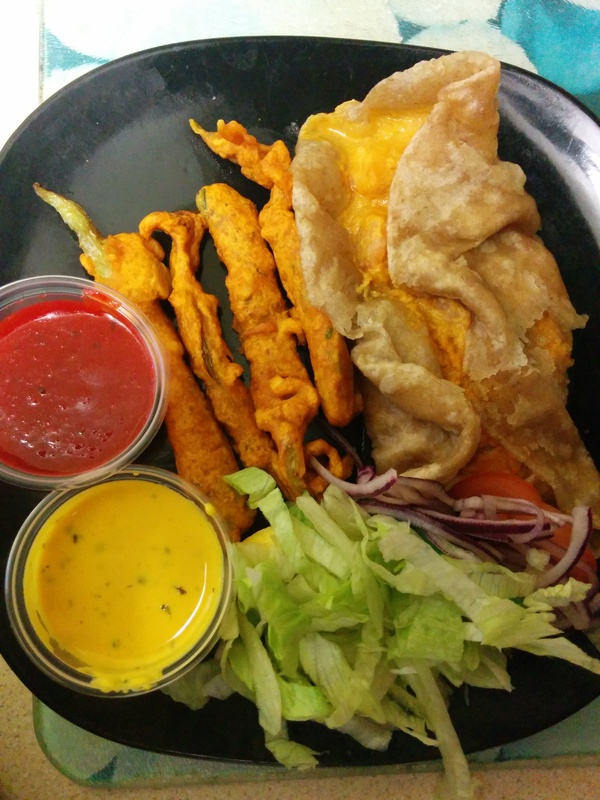 All the takeout classics are present and accounted for (pizza, Chinese, burgers and Indian), but you’ll also find some more unusual takeout on this list, including one of my favourite Japanese restaurants, Sakushi. If you’ve never visited Sakushi before, it’s a Campo Lane establishment with a revolving conveyor belt of sushi that makes it perfect for grabbing some quick, healthy food during the working week. I’ve eaten at Sakushi a couple of times before, and have even treated myself to the occasional sushi takeaway, so this review is definitely long overdue! When you place an order through hungryhouse, you enter your postcode, and the website brings up a list of all the takeaways willing to deliver to your location (and usually a few places that are nearby, but are collection only). If you’ve got a particular craving, you can instantly narrow down these results, by selecting a type of cuisine from the side menu. hungryhouse’s list of nearby takeaways also displays each establishment’s vital statistics, including the type of cuisine on offer, delivery charges, and the minimum you need to spend in order to qualify for delivery – ideal for quickly zeroing in on a restaurant. Once you find a place you like the look of, just click it to see their full menu. This is all good stuff, but I already had my heart set on Japanese food, so I cut to the chase and brought up Sakushi’s menu. The great thing about Sakushi, is that their takeaway menu is exactly the same as their eat-in menu. This may not sound like a big deal, but Sakushi’s is a large, varied menu covering everything from sushi and sashimi, to curries, noodles, soups, and a wide range of hot and cold Japanese tapas. So, when you sit down to order a takeaway from Sakushi, you really are spoilt for choice. The size of their takeout menu also means that you shouldn’t discount Sakushi just because you’re squeamish about raw fish (or fish in general), as there’s a long list of other foodstuffs to choose from, including lots of cooked meat and vegetarian dishes. Even though we were only ordering for two, Sakushi’s menu was far too tempting, and we ended up placing a super-sized order. A few minutes later, I received an email confirming an estimated delivery time. However, around 10 minutes after that, I received a follow-up email, informing us that our meal would be later than originally estimated. Presumably, 10 minutes was the time it took for the Sakushi staff to take a look at our massive order, and realise they’d never be able to prepare and ship so much food, in so little time. This update was appreciated, as there’s nothing worse than sitting there twiddling your thumbs and jumping up everytime you hear a car approaching, until you eventually lose patience and call the restaurant, only to discover that, actually, your order is going to be a while yet. 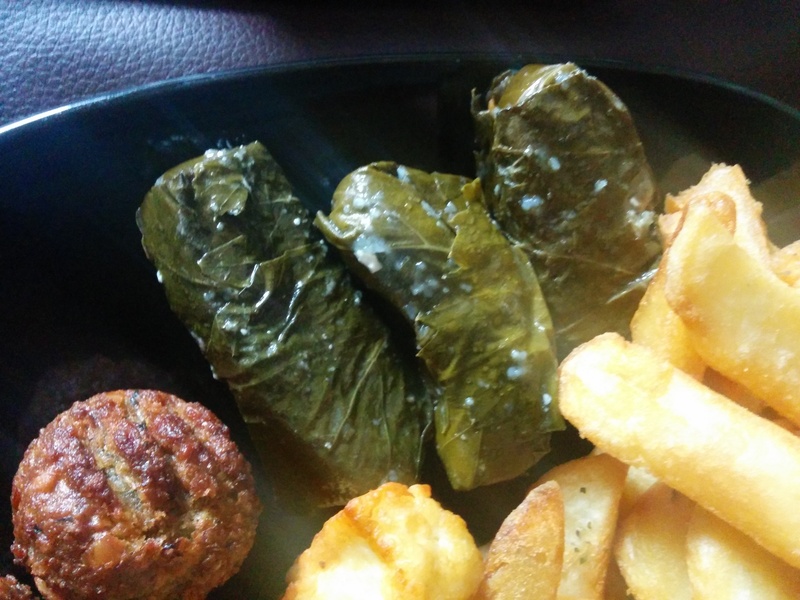 Email updates on your takeaway – it’s the future, people! 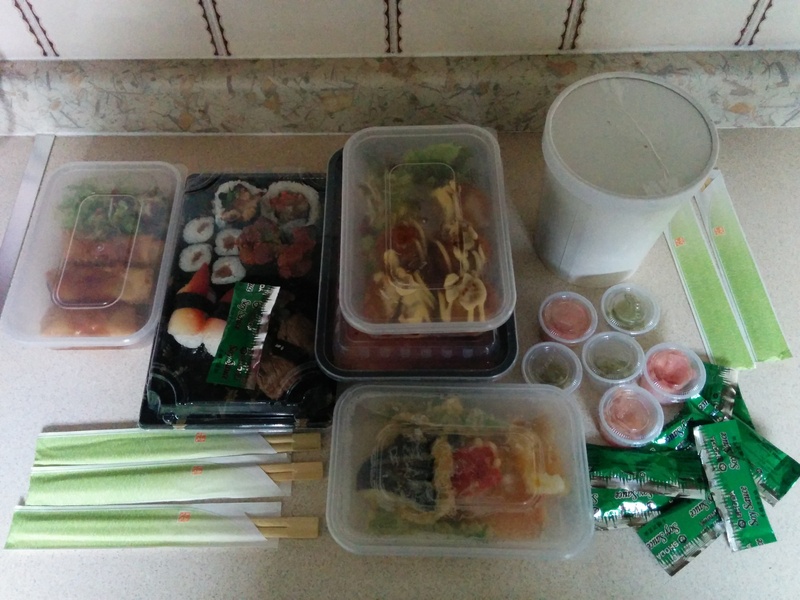 When our order did arrive, first impressions were good, as it came with lots of added extras, including packets of soya sauce, ginger, and wasabi, and lots of chopsticks. Clearly, Sakushi assumed we’d ordered enough food for a party, rather than dinner for two seriously hungry people. It’s okay, Sakushi, I don’t feel judged. 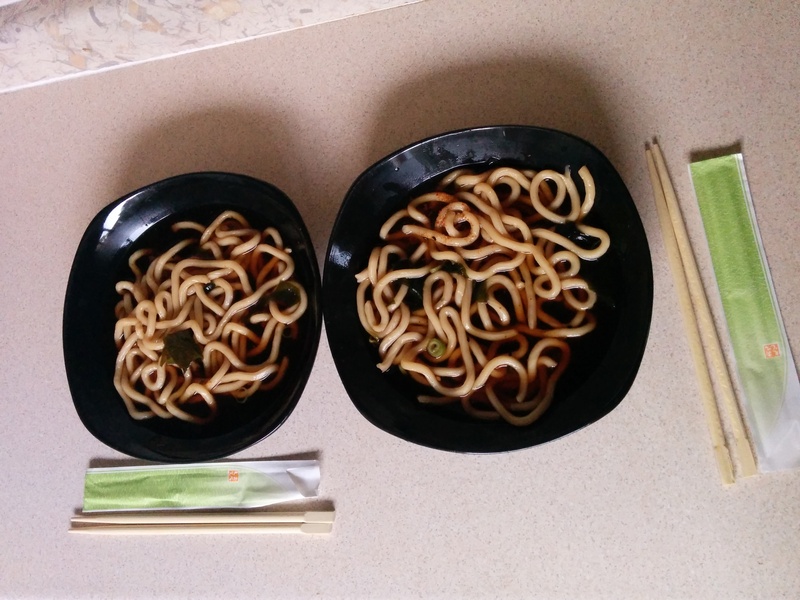 We popped the cold food in the fridge, and kicked off our Japanese dining experience with the hot part of our order. First up was the Vegetable Tempura Udon (£9.95), which consisted of a big container of soup and noodles, and a box of tempura-coated veggies. While I suspect you’re supposed to add the fried veggies to the noodle soup, we both prefer our tempura on the side, so I was glad that Sakushi kept the two separate. Despite being billed as a main meal for one, we cracked open the container of delicious-smelling soup, and divided it between two bowls. The plentiful udon noodles were perfectly cooked, and thick enough to make this a really filling soup, even when shared between two people. The broth reminded me of miso soup, as it was thin and dark, but had a really strong, salty flavour. Even better, when ordering the udon soup, you have the option to make your stock extra spicy. As a lover of hot foods, I’d leapt at the chance to crank up the heat, but when I saw all the chilli powder floating amongst the stock, I wondered whether I’d made a mistake. I love the taste of spicy food – what I don’t like is when restaurants dump a load of chilli powder into a dish, just because they can. One slurp of the soup, and I realised this wasn’t the case. Despite the lashings of chilli, the stock had the sort of heat that’s rich and tasty, rather than painful and tasteless. The next time I’m suffering with a cold, I’m ordering a bucketload of this stuff! Sakushi’s udon is one of those meals that feels like it’s doing you good – kind of like chicken noodle soup with a Japanese twist. As mentioned before, the soup came with a helping of vegetable tempura that I decided to eat on the side, rather than add to my soup. I usually find fried foods a bit bland and boring, but Sakushi’s generous wedges of courgette, pepper, red onion, and other assorted veggies, were lightly battered, so I could still taste the vegetables inside. I wish more restaurants took Sakushi’s light approach to batter! 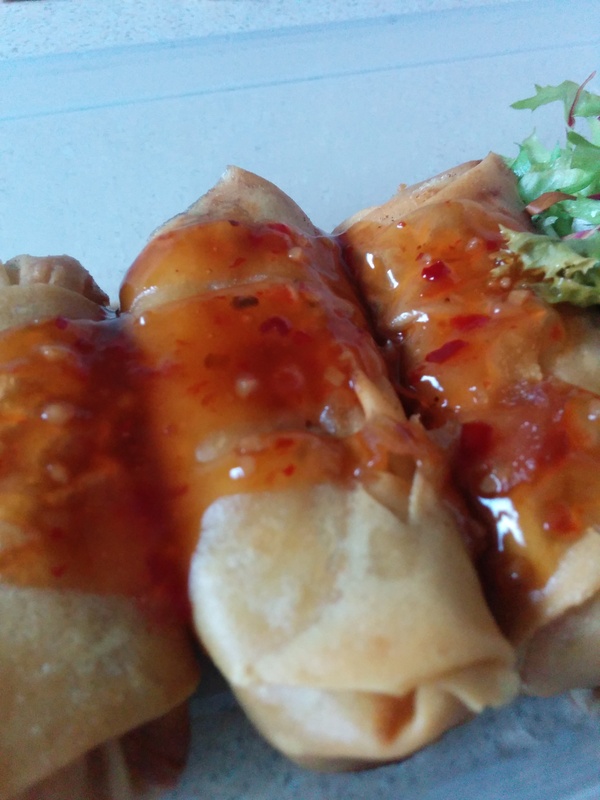 We then moved onto the first of our warm Japanese tapas, and tucked into a portion of “Harumaki” spring rolls, which came with a sweet chilli dipping sauce. I’ve eaten Chinese spring rolls before, but this was the first time I’d sampled Harumaki, and it was not what I was expecting. Rather than a crunchy coating, our three Harumaki spring rolls (£3.45) had a doughy exterior, and a creamy, blended filling. After I’d wrapped my brain around the concept of a soft spring roll, I really enjoyed my Harumaki. It’s richer, heavier, and far tastier than the crunchy spring rolls I’ve had previously. A side order of Harumaki may only consist of three spring rolls but be warned, their dense, chewy texture makes them extremely filling. Personally, I’d order this as a side dish to share. 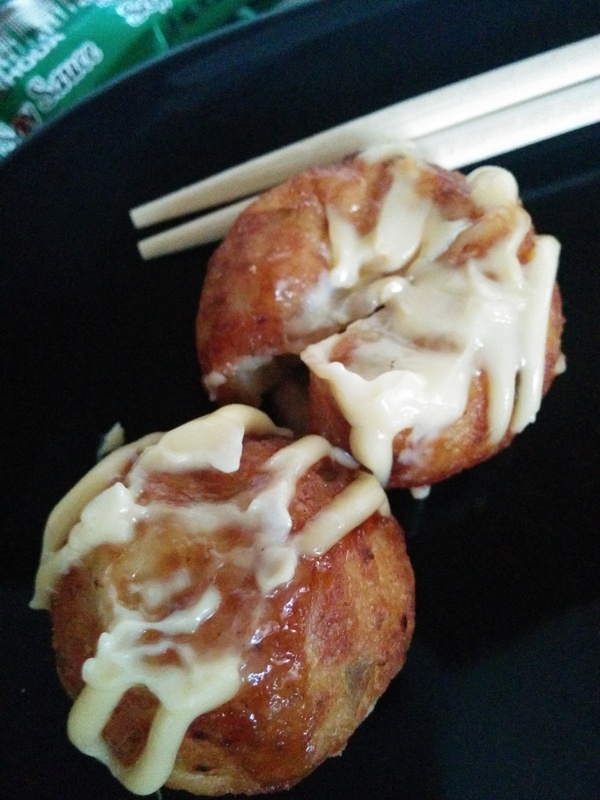 Next up, was a portion of Takoyaki (£4.95) which is five octopus dough balls covered in lashings of thick takoyaki sauce and mayonnaise. These dough balls have a similar consistency to the spring rolls, and contain a generous portion of octopus, to boot. The big pieces of octopus meant that the stodgy dough didn’t completely overwhelm the taste of octopus, which was what I’d been expecting. The mayo and the takoyaki sauce were rich additions to an already belly-busting dish, so once again I was glad we’d ordered these tapas to share. I would avoid ordering the takoyaki for yourself, in addition to a main meal – unless you have a seriously raging hunger. Hot side food dispatched, it was time to move onto the cold stuff, and really, no Japanese dining experience would be complete without sushi. Even if the thought of raw fish turns your stomach, that’s no reason to deprive yourself of the magic of sushi. 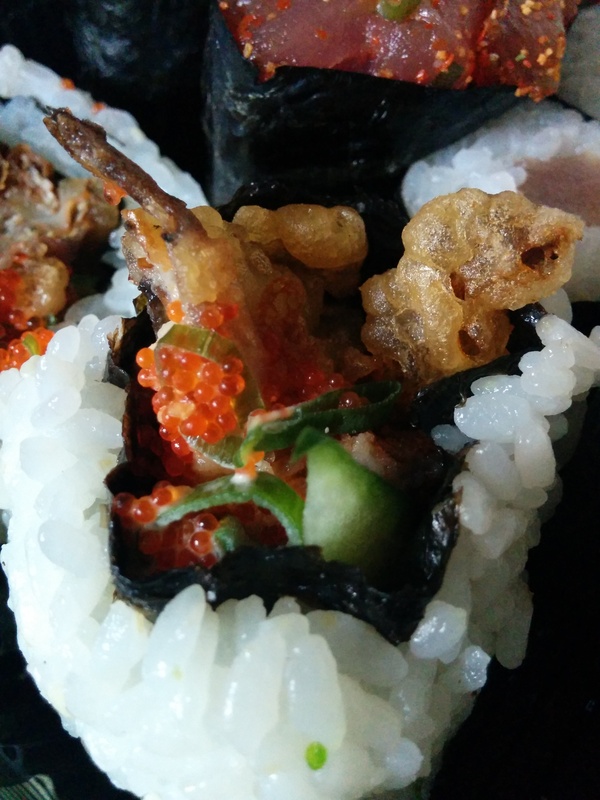 What makes sushi, well, sushi, is the vinegared rice. You can top this rice with anything you want, from raw fish and seafood (known as sashimi), right through to cooked meats, tofu and veggies. Our portion of steak nigiri (£3.50) proves there doesn’t need to be anything fishy about sushi. 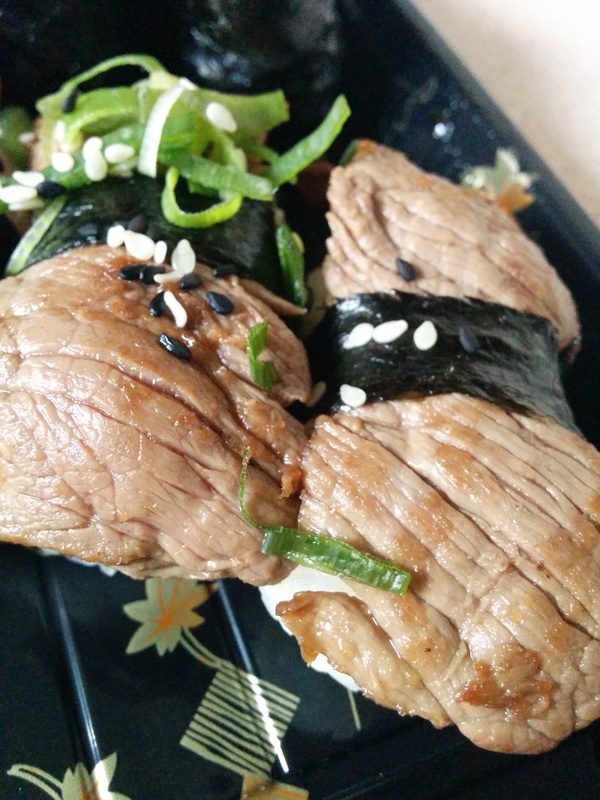 The meat nigiri was my takeout buddy’s idea, and once they’d taken a bite, they were only too happy to scoff the lot. The steak was thinly-sliced and cooked a crowd-pleasing medium. Sakushi also put their own twist on steak, by adding sesame seeds and a sprinkling of green onion, both of which were very welcome additions. Our advice? Take this Japanese twist a step further and slap some wasabi on those juicy morsels of steak; you won’t regret it! This is sushi for people who think they don’t like sushi. If you’re a fish fan, then prepare to be spoilt for choice. Sakushi offers a full range of fish and seafood (salmon, prawn, tuna, sea bass, eel, octopus, squid, surf clam, and crab) arranged on sushi rice, with lots of extras thrown into the mix, including tempura, seaweed, veggies, mayo, and even philadelphia cheese. 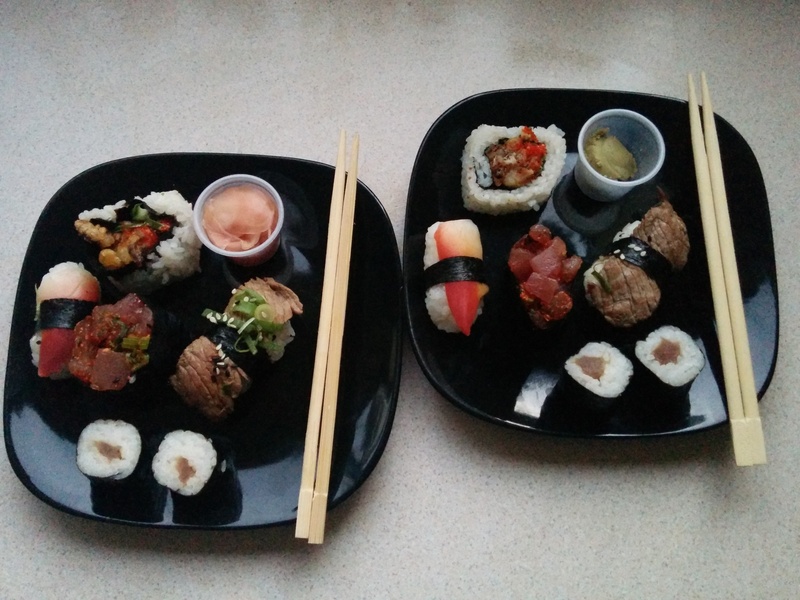 Our sushi feast continued with two Soft Shell Crab Uramaki Rolls, priced at £4.00 for the pair. 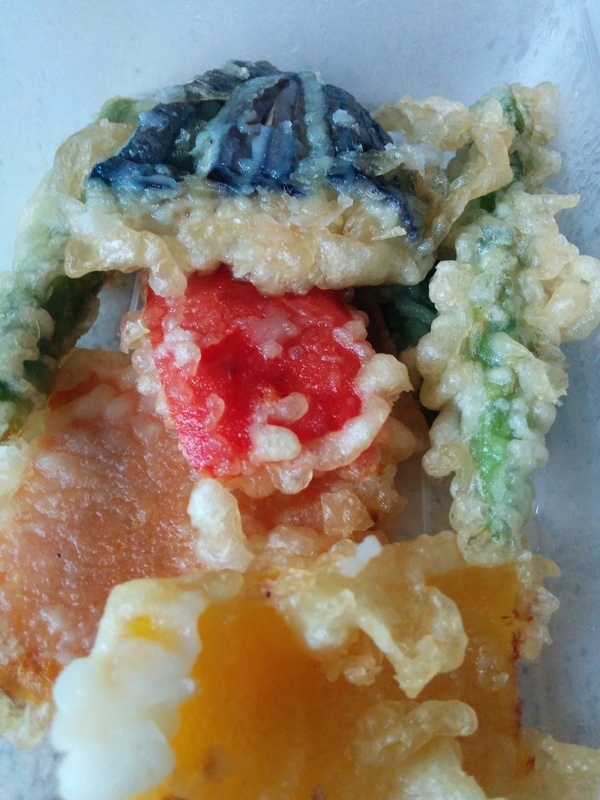 This sushi consists of crab meat, cooked in light tempura batter, and bundled up in sushi rice. Sakushi spoil you by cramming lots of extras into each uramaki roll, including spring onion, avocado, cucumber, and flying fish roe. Fish roe tends to be unpleasantly salty on its own, but when used sparingly it can add a strong, salty edge to a dish, which was the case with our uramaki rolls. Paying £4.00 for two pieces of sushi may sound excessive, but these are large rolls, jam-packed with quality ingredients. The presence of tempura batter also means that they’re more filling than your average sushi roll, so I didn’t feel short-changed. Now, onto the raw stuff! We’d ordered four pieces of Tekka Maki (priced at £3.50), which is raw tuna, wrapped in sticky sushi rice. Maki is one of my favourite kinds of sushi, as it’s a perfect, bite-sized piece, and raw tuna is my favourite sashimi, because it has such a distinctive, earthy flavour, so I was really looking forward to this one. 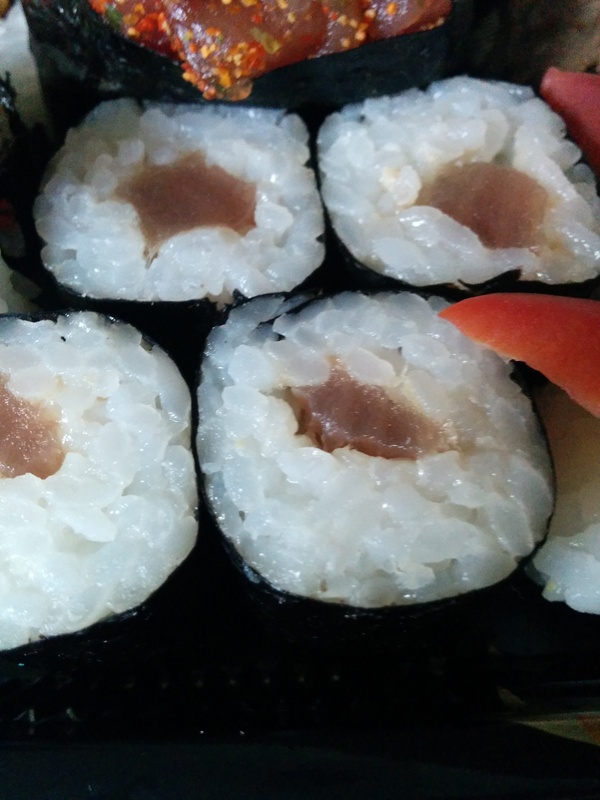 Sakushi didn’t disappoint, serving up big chunks of tasty tuna, bundled up in tangy sushi rice. A great dish for those who love strong flavours! Since I’m such a fan of tuna sashimi, and love spicy food, I was excited to spot something called Spicy Tuna Gunkan on Sakushi’s menu. For £3.50, we got two portions of gunkan, which is diced raw tuna, heavily spiced, and wrapped in yummy nori seaweed. Sakushi sprinkled the gunkan with some refreshing spring onion, which nicely offset the earthy tuna and strong spices. It’s little touches like this, that makes Sakushi such a great place for foodies, regardless of whether you visit the restaurant, or order takeaway. As someone who loves their spice, I can’t wait to order the spicy gunkan again. 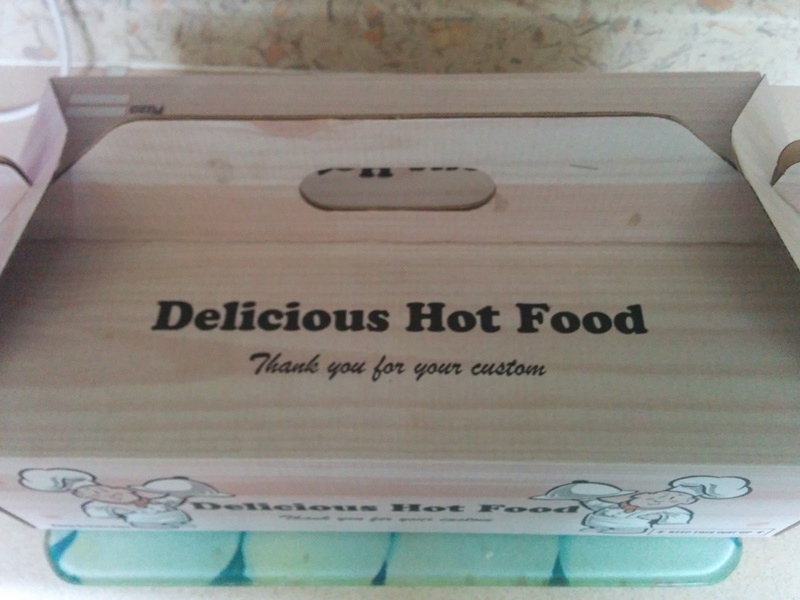 Highly recommended for hot food enthusiasts! 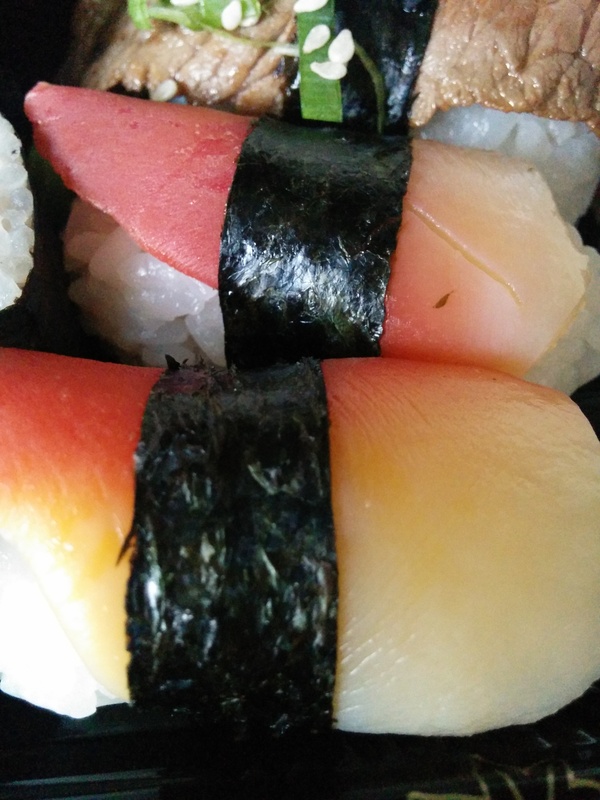 The final morsel of sushi, was Hokkigai Nigiri: two big pieces of colourful surf clam, served on blocks of sushi rice (£3.50). After the strong flavours of the tuna gunkan and maki, the hokkigai nigiri tasted very light and refreshing. It may not have been the tastiest sushi, but it had that clean, simple flavour you crave midway through a heavy meal. The hokkigai nigiri definitely helped revive me for the final part of our epic Japanese feast; the Chirashi Don (£11.45). Sakushi’s Chirashi Don is simple, but effective: a big bowl of sticky, vinegary sushi rice, topped with choice cuts of sashimi. Basically, if you love your starch and your carbs, love your fish, and are partial to strong flavours, then this is your dream meal. Sakushi’s Chirashi Don is pretty much responsible for getting me hooked on sashimi – it really is that good. The thinly-sliced sashimi not only tastes fantastic, but it looks beautiful, too. In fact, it looks so good that it deserves its own close up. This particular Chirashi Don was layered with lots of tangy salmon sashimi, raw tuna, and sea bass sashimi. Sea bass isn’t something I’d normally order, but it has a fresh flavour that perfectly complements the stronger-tasting salmon and tuna. The Chirashi Don was finished off with some flying fish roe. 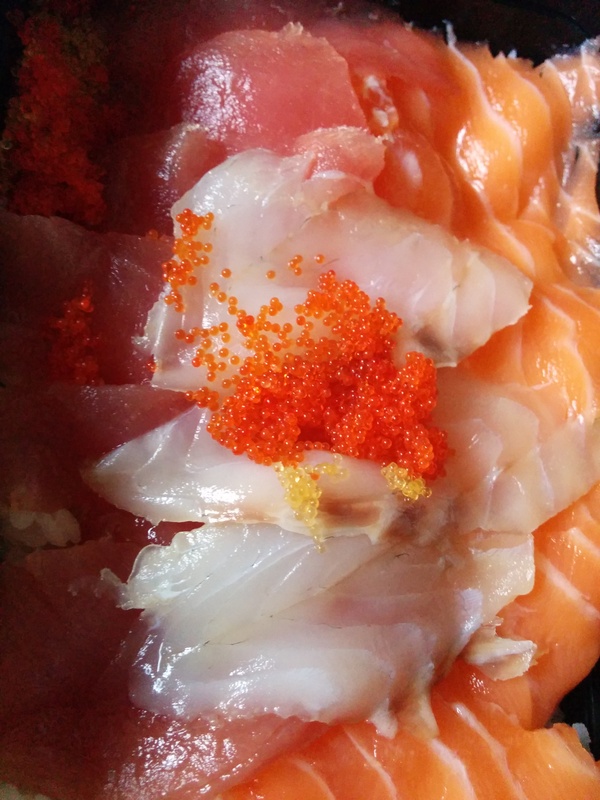 Personally, I’d avoid eating the roe with the slices of sashimi, as the combination of fish roe and raw fish is far too salty, but the roe does taste great mixed into the sushi rice. All in all, the Chirashi Don is a dream combination of delicious sashimi, and filling rice. Cuts of sashimi are frequently served on their own, without any rice, which never really fills me up. Sashimi is usually the most expensive thing on a Japanese menu, so when you come away from the meal still hungry, you do tend to feel hard done by. Sakushi’s Chirashi Don strikes a happy medium between satisfying those hunger pangs, and treating you to the finest cuts of raw fish. 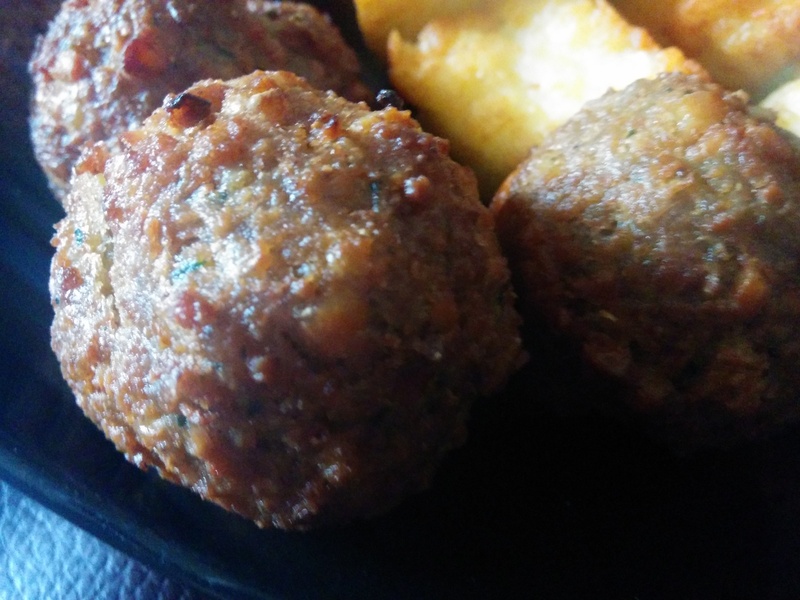 So, what’s my verdict on hungryhouse and Sakushi? Well, on the one hand I’m going to continue stuffing leaflets into my dedicated “takeaway menu drawer,” but on the other hand, I have absolutely no idea why. The sheer convenience of online ordering, means that my hoard of takeaway menus will continue to go unused. 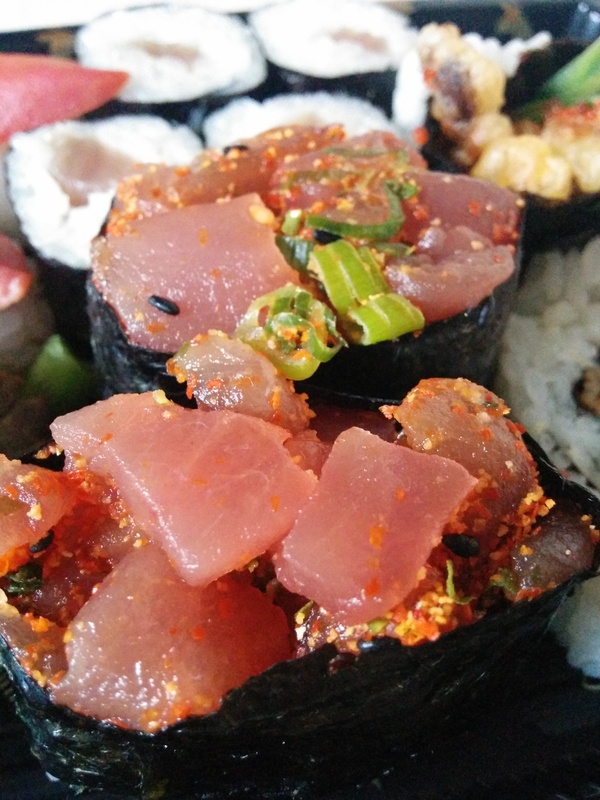 As for sushi takeout, it may sound weird, but it works, and you don’t feel quite as guilty as you do after stuffing your face with Indian, Chinese, and most other forms of takeout. Sakushi’s takeaway food is also every bit as good as the stuff served in their restaurant, so you can expect first class nosh regardless of whether you’re eating in, or ordering online. 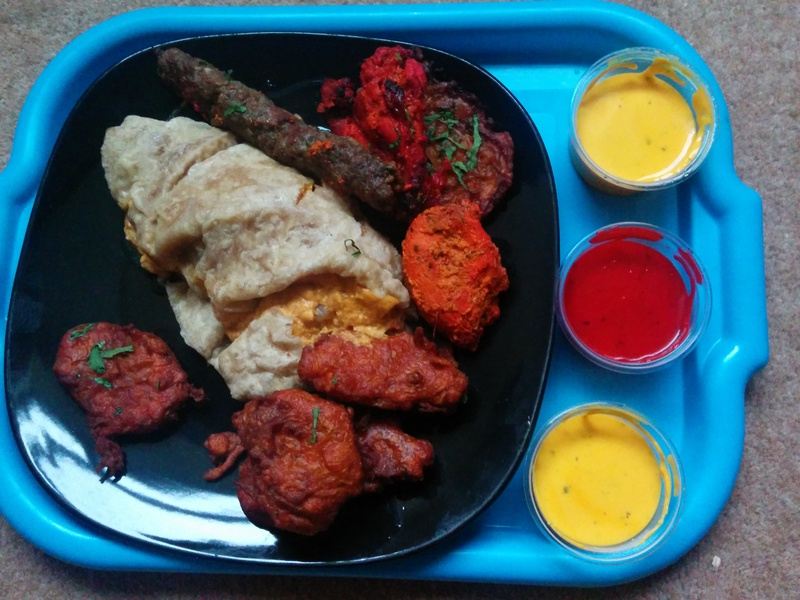 On a final note, it’s well worth checking out some of the other Sheffield takeaways that have made hungyhouse’s top takeaways list. Besides Sakushi, I can highly recommend Butlers Balti House for some of the best curries in the city, and Chan’s on Abbeydale Road for yummy Chinese grub.